If you thought you were close to finishing your M3 and M4 collection, take a moment to reconsider. Bill Walters worked with input from Vince Coniglio to produce this volume, the most comprehensive book on M3 and M4 knives. It includes all the known variants of the M3 trench knife, the M6 sheath, and M4 knife-bayonet variations. It also includes descriptions of the knives and scabbards. Whether you are a beginner or advanced collector, the life-like, detailed photos and info-filled captions will provide you with the knowledge to participate in this field of collecting. For example, the first "chapter" (nearly three quarters of the book) covers all of the known variants of the M3, the scabbards used with the knife, examples of (issued) boxed knives.. A collector will be better armed after careful study of the photographs in this section as well as studying the many original factory documents and drawings that accompany the text. Each of the known variants is given a rarity rating from 1-5. Each rating is clearly delineated and explained, with a "1" indicating commonly available M3s and "5" being reserved for "samples, prototypes, and one-of-a-kind M3s." The second section of the book is dedicated to the M4. Walters encourages collectors in this arena, remarking, "M4s represent an excellent area for collecting. Mint and boxed M4s are still available at very reasonable prices." 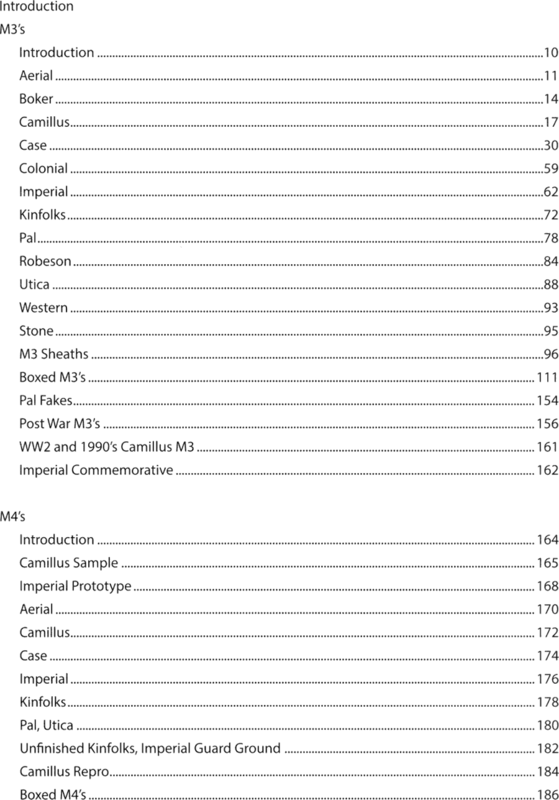 This book is a fantastic, stand-alone guide to collecting the M3 and M4. Self-published and printed in the USA, numbers of copies are limited. So, whether a dedicated knife collector or just wanting to stay on top of the most current research, don't hesitate to add this to your library. For the price of a single knife, this book will help you avoid costly collecting mistakes.